A couple of weeks ago, I got my hands on Google Home and immediately set out to use it and record my initial impressions. Now that I've given this odd little device a chance to prove its worth in my home, the time has come to finish the review. Out of the gate, I must confess to a little personal surprise at just how little my opinions have changed from the first 24 hours I had to spend with the device. As such, I'm not going to repeat everything I said in my first post. This is an addendum. I will touch on all of the subjects again and add details where there is more to say – because there is still a lot to say. Also, I want to thank the commenters on that post for bringing up subjects and questions. I've tried to address most of them here. 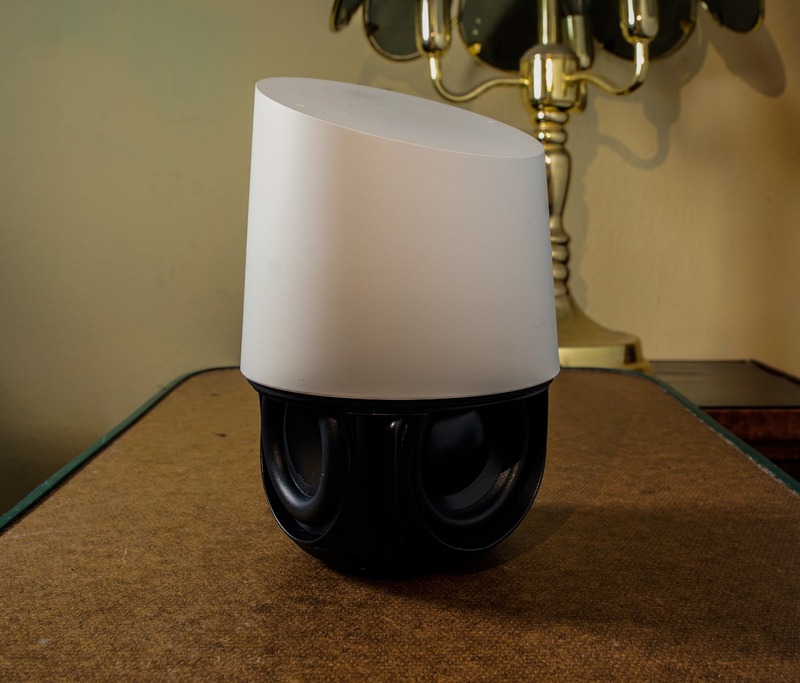 The upper portion of Google Home is made entirely of white matte plastic with an off-angle slice across the top. Hidden within the plastic is a ring of multi-color LEDs that light up to show when Google Home is listening or working to complete a request. The bottom portion is dedicated to a speaker for music and responding to users, but it's hidden inside an interchangeable shell. Google is selling these either with a fabric layer or solid metal. That's how you might describe Google Home, but it doesn't really convey its design, which is a pretty tricky thing to explain. It's a work of art in the realm of subtlety – both interesting and utterly forgettable. Everything about this device is designed to be easy to ignore. There are no shiny parts (unless you put on a metal base) and everything about it is non-descript. It even shares a couple of physical similarities to a Renuzit air freshener; and I've got no doubt that was an intentional decision to encourage people to glance at it and immediately dismiss it as something else. This all serves to be a reminder that Google Home isn't a conversation piece or a piece of tech to show off. It's an appliance that you install and use. Period. I covered the setup procedure with my first impressions post, so I won't repeat it here. After going through the setup a second time (adding Home to another room), I don't know that I'd necessarily say setup is completely foolproof, but I would trust any average person to be able to get through the procedure without much stress. 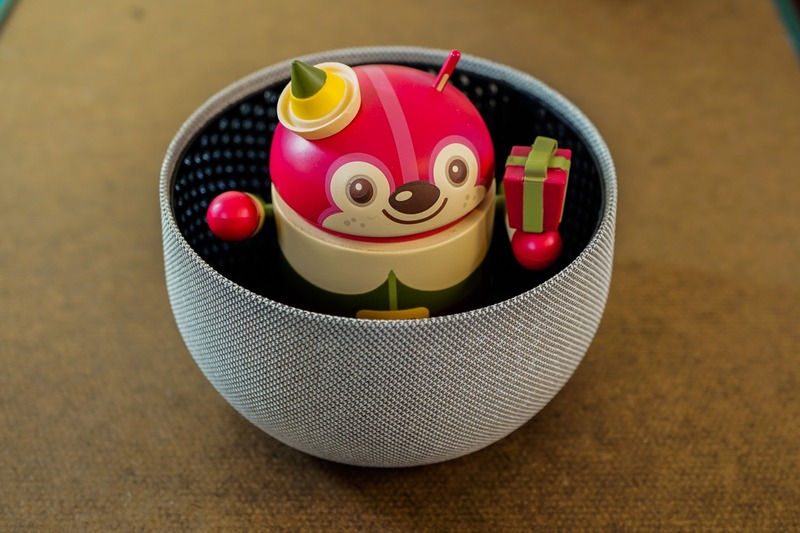 There is one bit I would like to add since many people may not know it's possible to create groups of multiple Chromecast Audio and Google Home devices and configure them to play in sync. Start in the Google Home app and open the Devices screen. Find one of the audio devices, open the overflow menu and tap Create group. Select the devices you want and give the group a name. Once that's done, cast some audio to the group and listen for the one that's ahead of the rest. Go to the overflow menu, Settings, Group delay correction. Follow the instructions and add a delay to each unit until you're happy with the results. Thanks to RJ and blkandblu for bringing this up in the comments. The big thing that truly separates Home from our phones is that it completely and absolutely relies on voice commands. It has no screen and only a couple of very basic touch elements. Fortunately, Google has basically nailed it. Interacting through voice alone is so good that it crosses into that territory where it's a bit unbelievable. Home has an uncanny ability to understand almost everything I've ever said to it. Home has an uncanny ability to understand almost everything I've ever said to it. As I said in my first post, it took very little time to become comfortable speaking to Google Home without raising my voice. I've even grown accustomed to speaking at just slightly louder volumes when I'm in a completely different room or I've got music playing above the lowest volumes. Google attributes this to a pair of far-field microphones and some computational magic. I was spoiled within days. I can't get anywhere near the same consistent accuracy from any other device I've ever used. The last time I was driving in my car and correcting the dictation of a text message for the third time (a painfully common occurrence), I started to think about how great it would be to cut a hole in my dashboard and mount a Home unit right there. That's how good this thing is. Seriously, Google, give me a way to add these mics for use with Android Auto and I'll be the first to preorder. Of course, great hearing isn't anything without good comprehension skills, and Google Home is very competent. It's hard to quantify how well a system can grasp any particular language, but it's fair to say that imprecise language and vague terms will work far more often than you might expect. You're not locked into saying every word or lining every word up in exact order. It's not all that common, but problems occasionally manifest from these little linguistic gotchas. A more practical example might include two YouTube channels, one titled "News and Reviews" and the other "The Latest News and Reviews." When you say "Hey Google, play the latest news and reviews video on my TV," it's unclear if part of this is a command to get the latest videos from one channel, or simply any video from the other channel? To be fair, I'm not really complaining about this so much as acknowledging that it happens. It's a problem with our language and it's not really something we can expect to see resolved for a while. 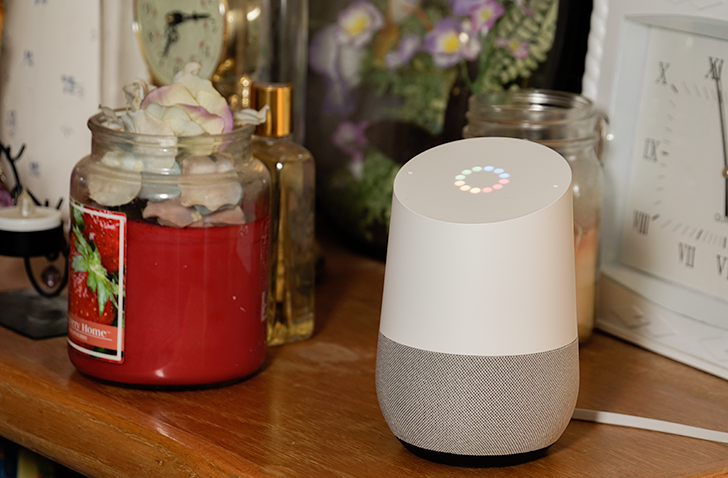 Among the AP team members with a Google Home unit, most of us have pointed out an instance where it seemed like a command had gone haywire. After a bit of examination, it often became clear that the wording of the request could be interpreted another way or may have triggered some unanticipated behavior. For as good as Google Home is at listening, there are at least a couple of ways that it doesn't work as intended. Perhaps the most annoying is the now infamous "answering on another device" toast message. If your phone is set up to respond to the "Ok Google" activation phrase and it's in proximity to Home, you're going to see this eventually. Google implemented a clever trick to prevent both your phone (or many phones) from trying to respond to the same command while Google Home is. It's a great idea and absolutely necessary to prevent an obviously ridiculous situation where both devices try to answer the same request. Unfortunately, it can get in the way... a lot. The anti-collision feature doesn't even attempt to route commands based on the situation. Once you're in the room with Home, that's all you're going to get. This wouldn't be so bad if not for limitations that only exist on Google Home (more on that in a bit). Frankly, I think this is the real reason there's a physical button to shut off the mics. It's basically the manual hack to work around the anti-collision mechanism. I have a feeling this will be the first "bug" that gets fixed. The anti-collision feature doesn't even attempt to route commands based on the situation. In my first post, I also complained that Home really likes to wake up to the activation phrase, even if it shouldn't. This probably won't come up too often, but it's bound to be a problem if you watch a Google Home review on YouTube or listen to a certain Android-oriented podcast I've been known to show up on (ahem). Even if it happens rarely, it would be great to see a fix for it. The solution most people are proposing is to add voice recognition (not to be confused with speech recognition) so Home can discern who is talking, not just what they're saying. This may also solve the issue of multiple people automatically using the one and only signed-in account. Yes, Home is currently attached to just one account, much like Android TV before 6.0 came out. I'm not trying to suggest voice recognition is automatic or easy to implement – it's certainly not – and I absolutely understand the many practical reasons it wasn't a feature at launch. However, I also know that it's something Google has done on phones (remember Trusted Voice?) and some Googlers have already confirmed it's coming in the future. Since we know it's in the works, I'm disinclined to ding Home too much for this shortcoming, but it's still something new buyers should be aware of. 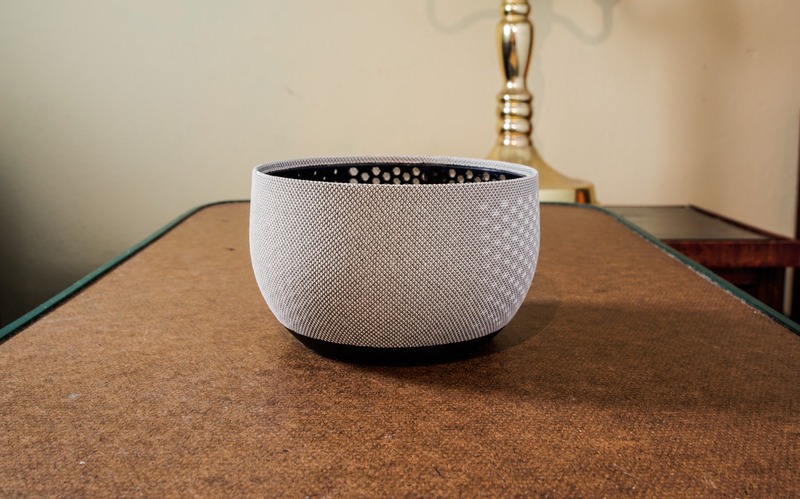 In my first post, I made a point of using Google Home by itself before setting up any home automation gadgets or IFTTT recipes (now called applets, I guess). I'll want to revisit Home by itself and within an ecosystem including Cast devices, then move onto my experience combining it with Samsung Smartthings and IFTTT. There's a list of current features Google Home supports, or at least these are the things Google wants to promote. Most of these are really just variations on questions you can ask and expect to get a helpful answer. The problem that might not be clear from a first look is just how little you can actually do beyond asking questions. I expect a lot of people will see Google Home on a store shelf and be surprised when expected features are missing. This is a good time to point out the list of supported services. To say that it's not very dense would be an understatement. However, for as short as the list of integrations may be, it's almost shocking to see that Google's only supported utility services are Keep and Calendar. They are technically supported, so it's not a lie, but I wouldn't say they're complete by any objective measure. You can't set reminders, Keep can only be used as part of a shopping list feature, and even the calendar is very limited – you can ask about events on your primary calendar, but forget about adding a new event or asking about any other calendar. Oh, and things like Gmail and Hangouts are off limits too. There's no support for sending messages yet. Every single one of these things can be done on any modern Android phone with voice commands, most of them for several years, but none of them work on Google Home. I expect a lot of people will see Google Home on a store shelf and be surprised when expected features are missing. I certainly would. I don't want to sugarcoat this, these are somewhat damning statements. It's not that all of those capabilities won't be added in due time, but it's hard to rationalize a good reason for why they weren't there by the time Google Home began shipping. I just said a few words and the right things happened. None of this is to say that you can't get tons of value out of the existing features. You really should underestimate how useful it is to ask for something from Google's knowledge graph, set timers and alarms, or request news and your daily agenda. And let's not forget you can play music from a supported service or start casting YouTube videos to your TV (if you have a Chromecast). Some of these things might not sound like a big deal, but they're really great features to have so readily available. Last night, I wanted to take a short break from writing this review, so I walked into another room and asked for music, spent a few minutes stretching my legs, then told Home to stop the music as I walked out. It was completely effortless. There was no need to unlock a phone, no need to pull up an app, no need to type in a search, and no need to hit the Cast button and pick a target. I just said a few words and the right things happened. Google assistant actually has a huge bag of neat tricks. People have reported that they can ask about flights without knowing the flight number. It seems Google is smart enough to look at your email and calendar to discern which flight you're asking about. Google Home is reminiscent to an Apple product in that it seamlessly performs very well with the things it's meant to do. Based on the services that do work and how functional they are, I suspect the Google Home team had a deadline to meet and chose to focus on the friendlier entertainment-related features and save the utility/productivity services for later. Objectively, that was the right call. 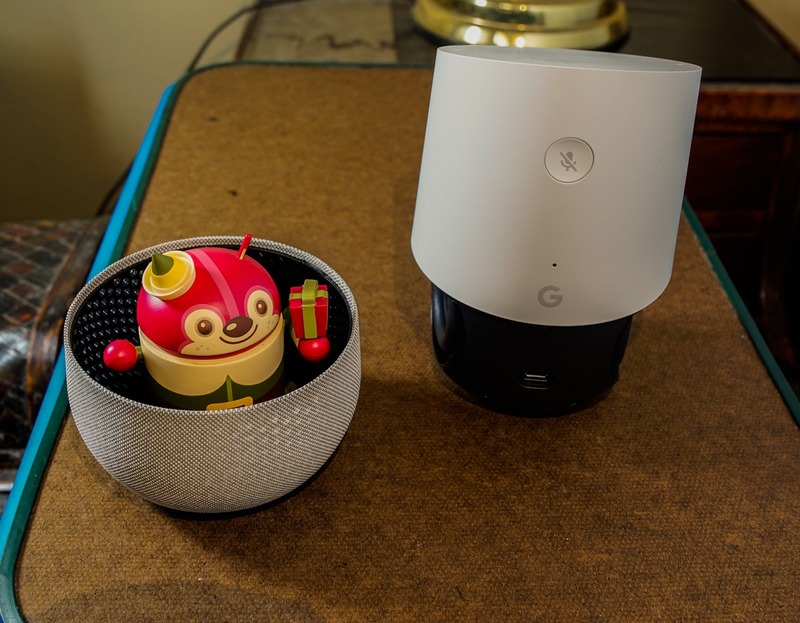 Making Google Home fun to use is going to appeal to a larger audience. Also, thanks to privacy concerns and the likelihood that productivity applications will be more difficult to "get right," it was probably wise to introduce those more slowly. However, it leaves a big gap that early buyers will probably have to wait a long time to see filled. Google Home is reminiscent to an Apple product in that it seamlessly performs very well with the things it's meant to do. Once you venture outside of those lines, the gaps in functionality show through. And much like most first-generation Apple products, it's pretty easy to find those lines. Google will obviously continue to build out the platform, but that's not going to happen overnight, and certain issues may remain for a long time to come. Home automation is a complicated subject. In my mind, there have always been four major hurdles to overcome before home automation could possibly become mainstream: cost, usefulness, compatibility, and the human interface. It's fairly obvious that Google Home's place in this equation is to provide a friendly and frictionless interface. If you've tried some of the software designed by the hardware manufacturers, I wouldn't be surprised if you gave up and ripped them out of the wall. Such applications usually range from mediocre to outright terrible. So, does Google Home rate as an improvement? Without a doubt, yes. Google assistant currently supports just Samsung Smartthings, Philips Hue, and Google's own Nest. A short list, to be sure, but others will come on board in time. Technically, you can also use IFTTT to reach a few more hardware platforms, but that requires a bit of extra work. I decided to give Smartthings a shot, so I ordered a Hub and a couple of AC control units. I won't turn this into a review of Smartthings, but I have to admit that it's an awfully high price tag for what amounts to a pair of remote control outlets. Samsung isn't the only offender, basically all of the companies getting into this field are aiming at very high markups. The setup procedure with Smartthings is easy enough, albeit fairly unpolished. Linking Google assistant to Smartthings is also pretty quick. There's very little to actually say about using Google Home to control basic on/off actions. I mean, it worked as it should. Google's language interpreter is flexible enough to allow for a few vague or slightly inaccurate names. There's probably about 2-3 seconds of delay between voice commands and a controller switching on or off. Nothing here is bad, it's just not that interesting after the first few times. Amazon Tap next to Google Home. Google Home works great for the purpose of home automation. However, for some people, it might actually be too simple. After preorders shipped to customers, there was an immediate comparison to the Amazon Echo, which legitimately beats Google Home in one area: flexibility. As it turns out, Google Home only allows for devices to be attached to a single room and there's no inherent support for custom groups. This feature would be useful for things like turning on a single light in each room when you're just getting home. Alexa offers this degree of flexible grouping, support for more ecosystems, and a few other features. Amazon has a two-year head start and has made a point of catering to the home automation crowd. It's worth stating the obvious. If you're already seriously invested or planning to dig deep into home automation, Amazon makes a compelling argument to join its camp and will probably hold the lead for quite some time. However, going with the Echo or Dot means you're choosing Amazon's flexibility and configurability over Google's better language interpreter. Either way, they'll both evolve and improve as time goes by. Before saying anything more about IFTTT, I must first confess that I'm not really a fan. I love the idea and I want to like the service, but I find it oversimplified for the things I would want to do with it. I usually check back every few months, especially when there's a big announcement or new feature, but my interest fades quickly once I see it's still absent the features I want. With that said, Google Home brought me back to check it out again. IFTTT integration basically allows users to add custom phrases to trigger an action, optionally including a number and message. For example, you could create a command to take phone messages that sounds like, "Ok Google, there was a call at 9:15, Brian wanted to say he'll be late," and those details could be added to a spreadsheet in Drive. I'm not sure this will finally convince me to become an active IFTTT user, but it's the most compelling reason I've seen. Customizing Home with commands like this can be really powerful and enables users to do a lot of things that aren't yet supported natively, even things like sending emails and messages to a pre-selected person, adding reminders and calendar events, or controlling home automation hardware that isn't yet integrated with assistant. The catch is that these commands have to be predictable. Unless you know what you need it to do in the future, there's no way to plan ahead and create an applet. ...it's a chore to use [Alexa] and to learn the specific syntax to make things work. 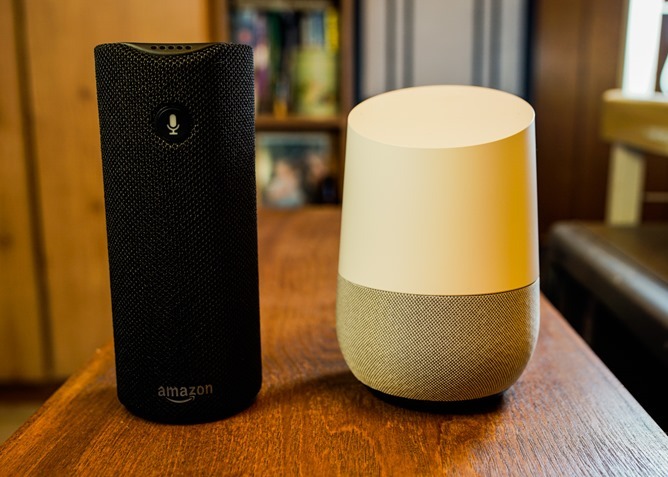 I had planned to give a more in-depth comparison between Alexa and Google assistant, but after spending a few hours doing side-by-side comparisons, I came to the conclusion that there's no good way to explain the differences and where each shines. The thing is that Alexa doesn't really shine at much of anything aside from home automation. I'm speaking from my own experience with Alexa, of course, and others may have a much better run with it than I have. But with that said, Alexa feels shallow by comparison. After repeatedly trying to get use out of my Tap, I find that it's simply not as adept at speech recognition, doesn't have the same range for natural language processing, and it is considerably less intuitive. Don't get me wrong, it's not bad, but it's a chore to use it and to learn the specific syntax to make things work. Google Home is a product sold at least partially on promises of what it will be able to do someday. While that's usually a bad thing in the tech industry, and especially for a company with a less than stellar track record for following through on ambitious products that require partnerships to make them successful (e.g. Google TV), things look much more promising for Google Home. Netflix integration has already been demonstrated on stage. Uber is joining the list soon with Lyft surely coming shortly thereafter. 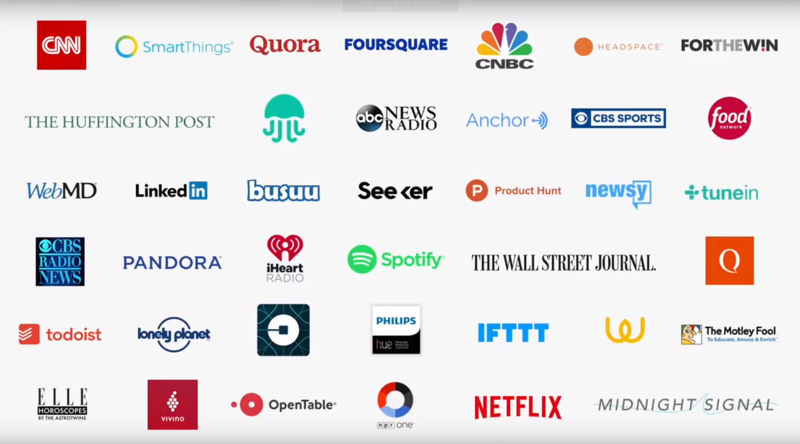 Plenty of popular web services were shown on the partners list at the October 4th event. I think it's even safe to assume most of the home automation OEMs have been trying to arrange to work with Google as quickly as they can. That's just the established and well-known companies. We're also going to see a lot of small and independent developers building out their own services to work with Google assistant once the open platform becomes available. As regular developers join the fray, we're sure to see something akin to Alexa's Skills appearing on Google assistant, but they'll be built with a better toolset and won't have to be preinstalled first – and that means avoiding the generally awful browsing experience of Alexa's Skill market. I have every confidence all of those things are true and there will be much more to come; however, the realist in me is prepared to see a lot of those things take far longer than most of us anticipate. I've spent most of this review talking about Google Home and giving a few nods to Amazon's Alexa-based products, but seeing as the market for in-home gadgets with voice control is ramping up, I think it would be a disservice not to editorialize on that subject for a bit. I won't really discuss Home itself in this section, so feel free to skip to the next section if you're really just here for the Home review alone. Google began shipping Home almost exactly two years after Amazon announced the Echo. Reviews of the Echo were generally middling as people liked the hardware and thought the concept interesting, but found very little to actually do with it. Nevertheless, estimated sales figures were great and Amazon quickly built a significant customer base. Naturally, things like this tend to get other companies talking (no pun intended). A couple of years have passed and now we have Google introducing the first true competitor. This has sparked questions about whether such products are useful to consumers or just a fad and people will be chucking these things into a closet to collect dust with a handful of other gadgets. Frankly, I think the answer is perfectly obvious. Even Hollywood assumes everybody understands how voice interfaces work. Since long before most of us were alive, people have been envisioning a future where we would interact with our environment through voice. Gene Roddenberry popularized the idea through Star Trek, but others like Walt Disney called for it a decade or two earlier. Voice controls are now so common in TV and movies that scripts don't even bother to explain them. Even Hollywood assumes everybody already understands how voice interfaces work. If it's not already obvious, this is a market that's about to explode with aggressive competition. Nobody doubts Apple is preparing a Siri-enabled device of its own, especially given that HomeKit (an API for interacting with home automation equipment) is already a part of Apple's ecosystem. Microsoft is surely developing its own competitor equipped with Cortana. It could even be argued that Microsoft already dipped its toe in with always listening voice controls on the XBox One, though it's not as extensive yet. Speech is almost always the least physically demanding way to communicate, and in some cases, it's the most efficient. Speech is almost always the least physically demanding way to communicate, and in some cases, it's the most efficient. Operating rooms, clean rooms, and other environments with special limitations are going to be popular destinations for products like Google Home. Expect to see customized versions become standard in hospital rooms (for overnight stays) within the next 5-7 years. I would even bet we'll see upscale hotels advertising some kind of voice assistant as an amenity within a couple of years. As I said, sales of the Amazon Echo have been startling, and early reports suggest Google Home has been flying off the shelves in some stores. Speech recognition has been a standard feature on phones for years, which means the general public has been acclimating to it for a long time. It won't be long before voice-enabled appliances in the home becomes normal. Predicting otherwise is basically an absurdity. You might as well be living in the late 90s and arguing that cellphones are just a phase. So, would I recommend Google Home? This isn't like a normal phone review where you already know you're going to buy a phone and what you're getting with it. Like any relatively new category or product, you have to decide for yourself if it's possible to derive enough value from it for your money. First, ask if this is even a product you'll need or use. It's not right for everybody. The most telling fact is that I'm still using Google Home after a few weeks. I certainly wouldn't suggest any voice assistant to somebody just after they took a vow of silence. Sure, they could still use it as a Cast-enabled speaker for music, but it would be silly. On the other hand, anybody with a crippling physical disability should have been on the pre-order list for Home on the first day. For everybody in between those two extremes, a voice assistant is probably going to add some convenience, but I doubt it will be life changing. The most telling fact is that I'm still using Google Home after a few weeks. I have plenty of gadgets that have only been used a few times, and a couple that I never even took out of the box, so believe me when I say I'm willing to abandon things that aren't very good. Google Home isn't one of those. It has proven itself useful and I've grown very used to having it handy. In fact, I now have two set up in my house and I'm using both. As far as choosing between Google Home and the Amazon Echo (or related device), there are really only two things to consider. First, Google Home is a friendly and competent tool for home automation, but if you need something more advanced with customizable grouping and a wider variety of supported hardware, it's hard to ignore Amazon's advantages... Or just wait until sometime next year when Google is mostly caught up. Second, if you're really just interested in Amazon's exclusive features like the Alexa-only deals, Prime Music, and the existing Skills (I don't think you're missing much with these), you'll obviously have to stay in that camp. In all other regards, I believe Google Home wins. I always thought the initial MSRP of $129 was set a bit too high. However, with a couple of deals in place for Black Friday / Cyber Monday, it can be had for as little as $74.25 (42% off). That's a pretty killer deal. If you're thinking about getting Home, I think it's definitely worth it at that price.